Pastrami this isn’t, but what it is happens to be freaking good! 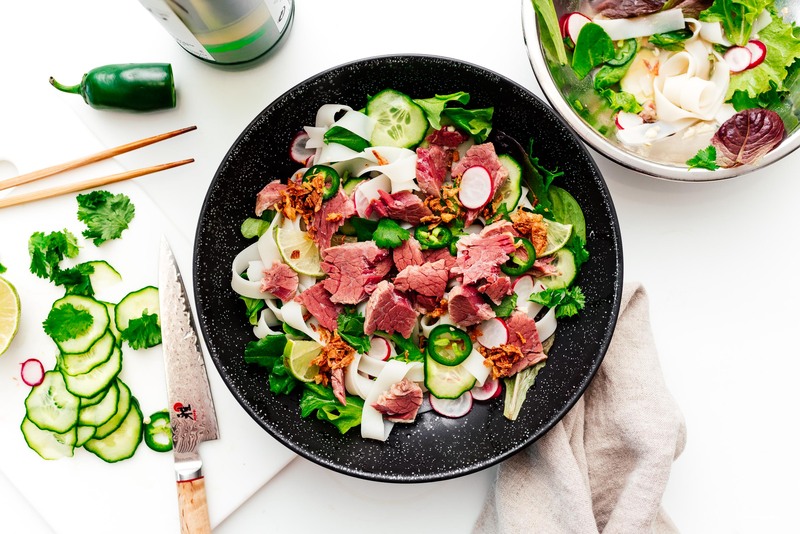 I’ve been meaning to try out Mike’s corned beef recipe for forever and when I saw a small brisket on sale at our local grocery store, I popped in my basket with the express purpose of pickling. A dip into a pink curing salt solution with some pho-forward spices and 6 days later we had corned beef! Glorious pink corned beef. Are you guys fans of corned beef? Personally, I actually like pastrami better, especially in sandwiches. But I’m not sure if that’s because it seems like that’s all they have when I go to Jewish delis. Or maybe it’s because people use the terms corned beef and pastrami interchangeably? If you’re anything like me, and you don’t have a clue what the difference is, I’m here to tell you: it’s in the smoking! 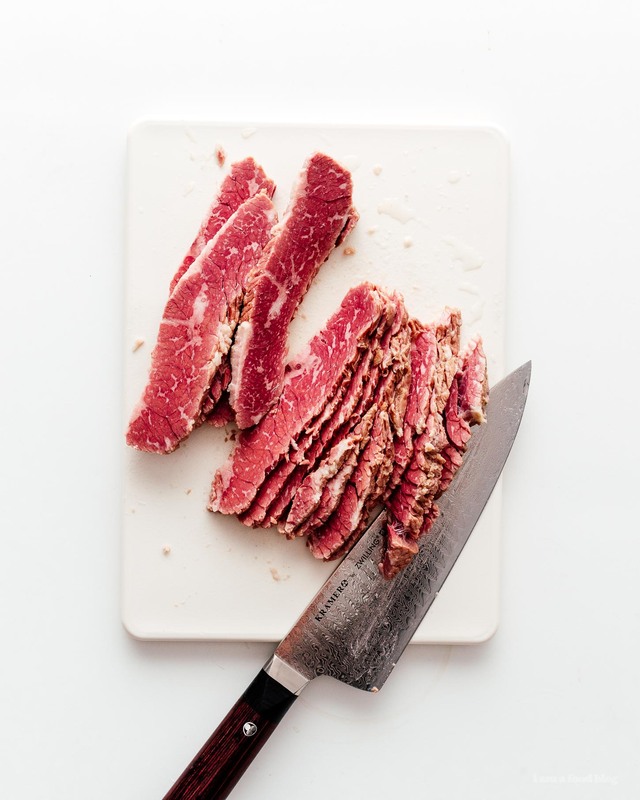 Traditionally, they were made with slightly different cuts of beef, with pastrami being made from navel beef and corned beef being made from brisket, but nowadays it seems like most pastrami and corned beef is made from brisket. The main difference is that corned beef is boiled and pastrami is smoked. They’re both brined before cooking in pink pickling salt, which is what helps the beef retain that gorgeous ruby red while being entirely cooked through. Pastrami gets an extra roll in spices before smoking whereas corned beef is braised in seasoned liquid. They’re both straight up delicious. 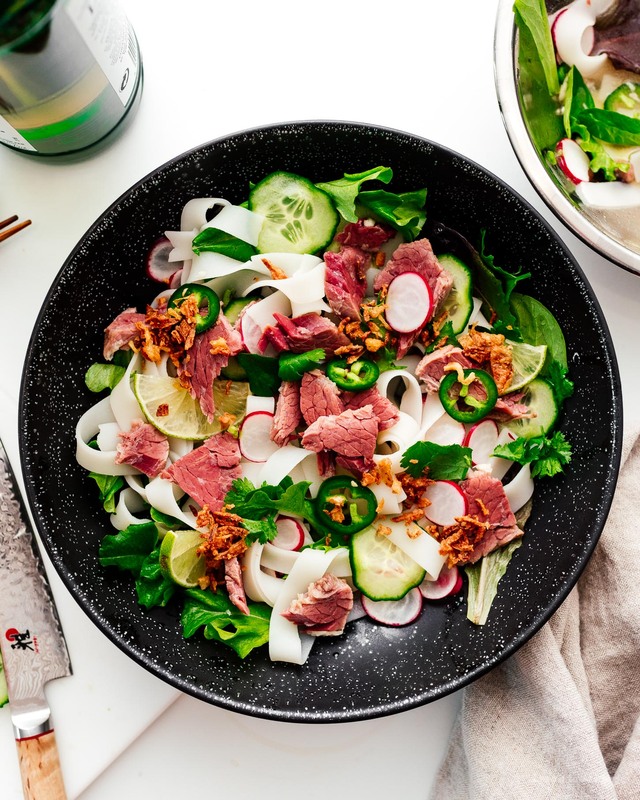 Most of the time I see them in sandwiches, or on breakfast plates like corned beef hash, but we went a little rouge here and made a quick noodle salad. To be honest, you can pretty much slice it and eat it as it is, it’s that good. Just be sure to warm it up in the braising liquid before eating because cold corned beef is nothing compared to warm corned beef. When you warm it up, everything gets all melty and juicy and just so, so good. Happy corn-ed beefing! Hopefully you guys tuck this one away for March – it’s never too early to start thinking about St. Patrick’s Day. Note: Pink salt, not to be confused with pink Himalayan salt, is actually regular salt mixed with sodium nitrite and dyed pink so that it’s not eaten by accident, and exists to prevent botulism and listeria. It gives corned beef it’s signature red color. It’s available on Amazon. 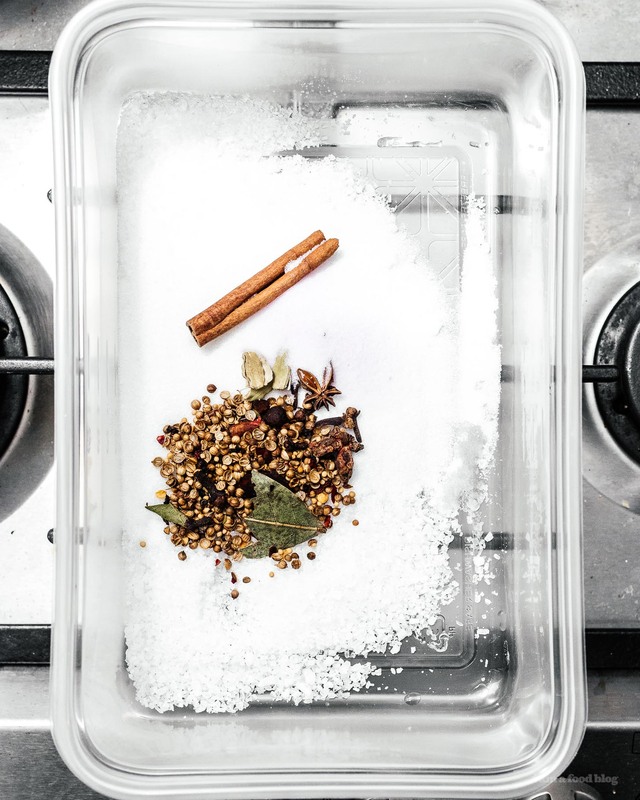 In a container large enough to contain the brisket plus water, combine all of the water, salt, sugar, and pink salt. Stir until everything is dissolved. In a large tea bag, add 1/2 teaspoon of each: cloves, coriander seeds, and fennel seeds. Add 6 whole cardamom, and 2 star anise to the bag. Close the tea bag and put it in the container, along with the cinnamon stick. Add the brisket and weight down with a plate so it’s fully submerged. Seal and store in the fridge for 3 days, then flip and weight down with the plate. Continue to bring for 3 more days. After 6 days, preheat your oven to 200ºF. Remove the brisket from its container and give it a brief rinse. Discard the tea bag and cinnamon stick. Add the rinsed brisket to an oven safe pot with a lid and cover with water. In a large tea bag, add the remaining 1/2 teaspoon of each: cloves, coriander seeds, and fennel seeds. Add 6 whole cardamom, and 2 star anise to the bag. Close the tea bag then add it to the pot, along with the cinnamon stick. Bring everything to a boil over medium heat, then cover and transfer to oven and braise for 4 hours. Once done, remove the brisket from the braising liquid from and slice thinly. Store any uneaten brisket with the braising liquid and reheat together to retain maximum moisture. Brisket keeps for 3-5 days in the fridge. I don’t eat meat but I love seeing cross-cultural takes on food! 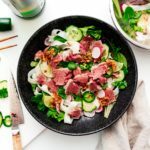 Kind of similar to this recipe, I recently went to a Taiwanese place in Brooklyn (Fan Fried Rice Bar) that serves a pastrami fried rice.